Legos are not just for boys anymore. Girls are now taking over the Lego world with the new line of Lego Friends. In addition to playing at Olivia's house or going to the stables, girls can how take Olivia and Nicole on a camping trip. Remember to pack those marshmallows for toasting! 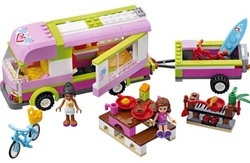 It is very rare to find a toy with no customer complaints but the Lego Friends Adventure Camper is one of those rare instances. Yes, all Lego toys come with small parts and all Lego toys must be put together, but when buying a Lego product that is something that just goes without saying. All Lego toys now come with numbered parts bags and detailed instructions making construction easier and allowing children to build the sets all on their own or with minimal adult intervention. One of the best aspects of the Friends Adventure Camper is the amount of accessories that it comes with. 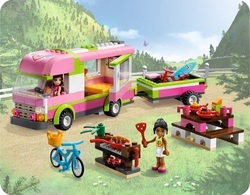 The set includes a camper, trailer, bikes, surfboards, cookware, food, grill, charcoal and more. All of the tiny pieces can be stored inside the camper, under the seats and out of the way. Inside the camper there is a seating area with a flat screen TV and both the top and side of the vehicle swing open to make playing easier. All of the Lego Friends pieces are fully compatible with other Lego Friends sets and other Lego sets as well. Since there are small pieces and the construction does require a little bit of skill, the Friends Adventure Camper is not recommended for children under 5. However, if the set is already put together, children over the age of 4 should still enjoying playing, as long as they are not tempted to put the pieces in their mouth. The main complaint is of the series as a whole, some parents have questioned whether we should really have such distinct toys labelled for girls and boys separately, but it all comes down to your own personal opinion on the matter. 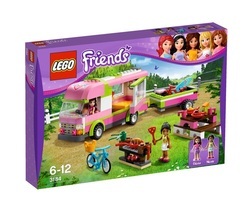 The Friends Adventure Camper would be considered the perfect gift for any little girl who enjoys Legos or one that may just be starting out her collection. You can also compliment this Friends Adventure Camper set with Olivia's House or the Heartlake Stables, both of which also come as highly recommended gift ideas.